I’ve ran into PostgreSQL case sensitivity myself before and I’ve seen it come up on the forums, so I thought it might be a good thing to bring up here. That is nice if you happen to like to write your queries with mixed casing. In the first two examples, you get a table called “person” with two columns called “fullname” and “address”. That may not be obvious in the second example since the names are not lowercase, but remember that PostgreSQL converts your SQL to lowercase for you. 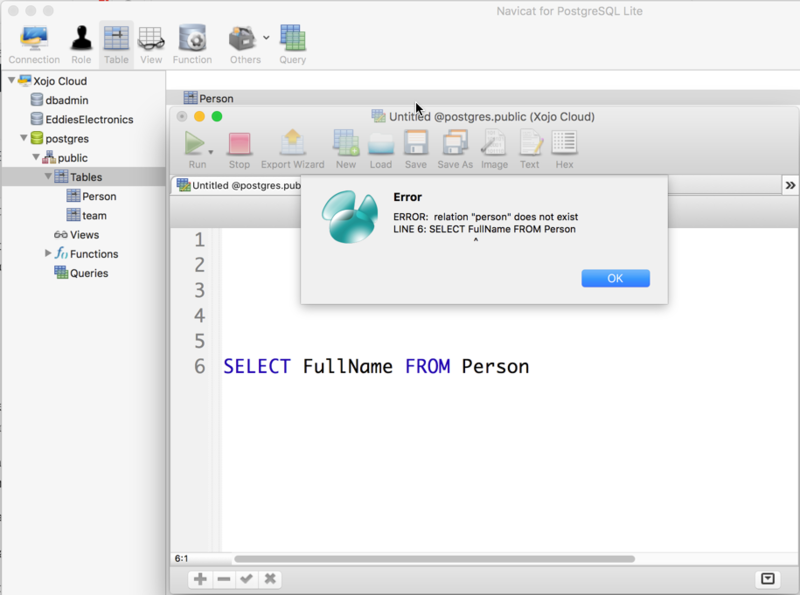 This is because PostgreSQL is converting “Person” to “person”, but there is no table called “person”. It is actually called “Person”. Obviously that can start to become a bit of a pain, so the moral of the story is don’t use quotes when creating tables or writing SQL queries so that everything is created as lowercase and things will work like you probably expect. You’ll especially want to pay attention to any tools you use to create SQL for you. If you use a tool’s UI to create a table and have a habit of typing in mixed case, the tool might generate SQL (or even the table itself) for you using quotes, which as you can see could mess you up later. Learn more about PostgreSQL in the Xojo Dev Center.